The Inspector in SONAR X1 has a wealth of data in a small footprint. The Inspector features all of your track data and also the buss that the track is routed to. This is very useful as once you make changes to your track you will probably want to adjust not only the track volume but also the buss that the track is feeding. Now you can without breaking your workflow. The Inspector also shows MIDI information and if you have an Instrument track you can switch between displaying the MIDI controls for the track and bus information. Just click on the Audio and MIDI tabs at the bottom of the inspector. 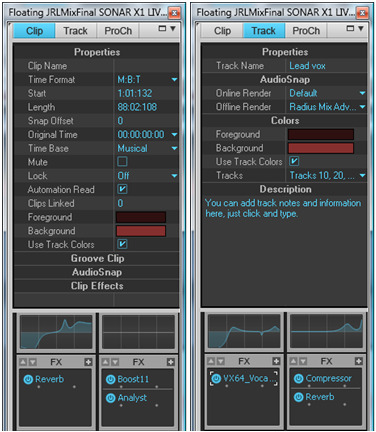 You can drag and drop both MIDI and Audio effects to the effects bin in the Inspector. If you like keyboard shortcuts you will find the Inspector shortcut easy to remember just press the “I” key to open and close the Inspector. Don’t forget that you can float the Inspector or dock it left and right too. If that wasn’t enough you can also display all clip and track property information too. 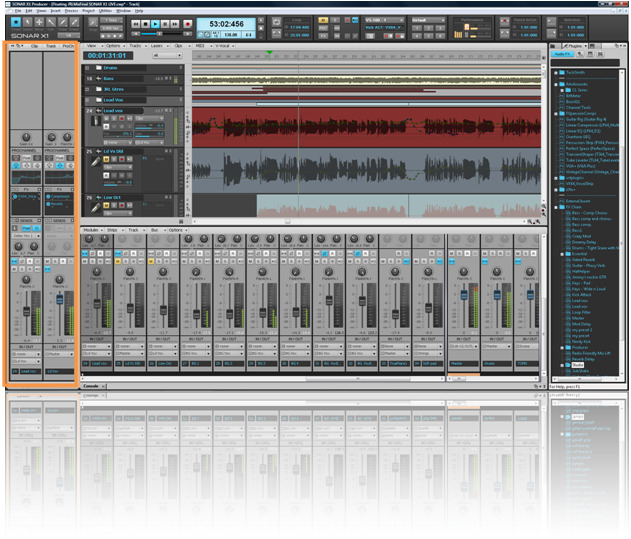 Let’s say you have many vocal takes and you want to change the individual clip properties. Click on the track and then select the clip tab at the top of the Inspector. As you click on each Clip the clip properties will update. This means you can easily adjust settings for individual clips without the need to right click and navigate to the clip properties menu. You can use this same technique to access different track information too.